In less than 24 hours we have our second water main break on our block. A crew worked all night, patched things up and now there is another break so they are at it again. I am a happy citizen knowing that these folks are diligently working to make sure our city infrastructure is in good shape. It is easy to take our city infrastructure for granted. Yesterday evening we felt like we were in a campground, having to go outside, around the corner for potable water. (The City has a portable trailer of water for just these situations.) Any water used in the kitchen we have to carry, so we are super efficient; we cook and wash with just what we need, no more. The toilet can not be flushed on a whim. We brush our teeth with a glass. The laundry has to wait. It takes great effort and collective thoughtfulness for our neighourhoods to have everything they have. It is not by chance. It takes equally great effort and collective thoughtfulness – and maybe more – for our neighbourhoods to continue to have what they need to be vibrant and live, serving citizens well. We don’t build our cities once and then enjoy them for the rest of our lives. Our infrastructure needs maintenance or it deteriorates, whether it is the pipe bringing water to homes or the pothole crew fixing up a nearby street for the second time this month. There is a lot to look after, too. 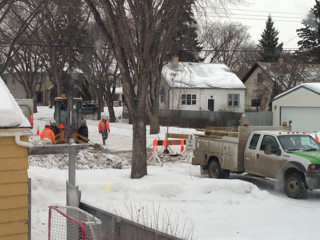 In 2011, Edmonton had 3681km of water main and a total of 385 water main leaks to repair. As we organize ourselves into cities, we also organize local government to look after the needs of the population congregating in each place. These folks are what Marilyn Hamilton calls civic managers – the people whose work is creating and looking after civic infrastructure on the public’s behalf. They play a crucial role in setting up the infrastructure before inhabitants arrive, as well as long after a neighbourhood is established. They get the work done, and they also leave messages in my mailbox letting me know where I can get water. They also appeared at my door this am to tell us there was a second break. They are looking after the infrastructure that we rely on. Thank you to the City of Edmonton and Epcor, the City of Edmonton’s company that is doing the work behind my house, for looking after our waterworks. I appreciate what you do to support all that happens in our city. What are the essential infrastructures we provide ourselves in cities?